On this day in 1955, Rosa Parks took her fateful bus ride in Montgomery, Alabama. As the story is often told, Parks was a diminutive African-American seamstress who was weary from a long day of work at a downtown department store. Her feet ached, so when the driver ordered her to give up her seat to a white man who had just gotten on the bus, Parks refused, accidently setting into motion a series of events that led to the modern Civil Rights Movement. The problem with the story, told in that way, is that it is grossly misleading. Parks was not the first black person to be arrested in 1955 for refusing to give up a seat on Montgomery's racially segregated buses. There was a growing sense in the African-American community that the time was ripe for change. The previous year, the U.S. Supreme Court had issued its landmark decision in Brown v. Board of Education, declaring that segregation in public schools was unconstitutional. The Women's Political Council in Montgomery was already laying the groundwork for a boycott of the city bus system when it learned of Parks' arrest. Given the respect and support Parks had within the community, the group decided it was an opportune moment to take action. A one-day boycott was held on the day of Parks's trial (she was convicted of violating Chapter 6, Section 11 of the Montgomery City Code and ordered to pay a $10 fine plus $4 in court costs) and a longer one was launched shortly afterward, crippling the finances of the company that ran the bus system, which typically derived over 75 percent of its fare revenue from African-American passengers. That boycott lasted more than a year, until late December of 1956, when the Supreme Court upheld a lower court ruling in Browder, et al v. Gayle that the segregation of Montgomery's bus system was unconstitutional. 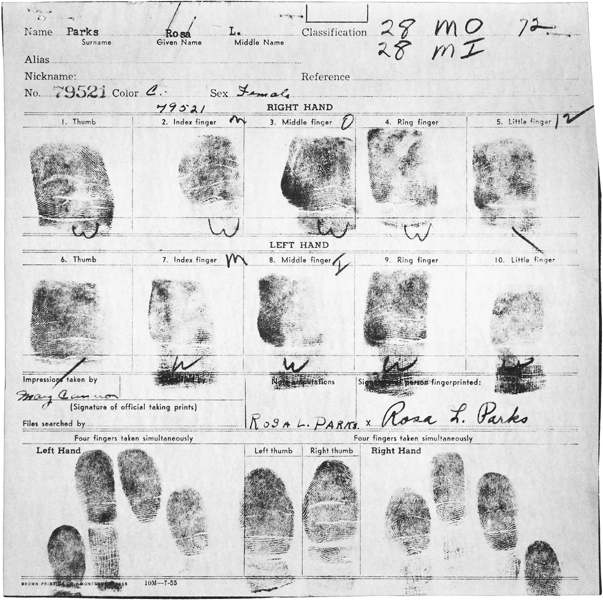 The documents shown here were submitted as evidence in Browder v. Gayle. 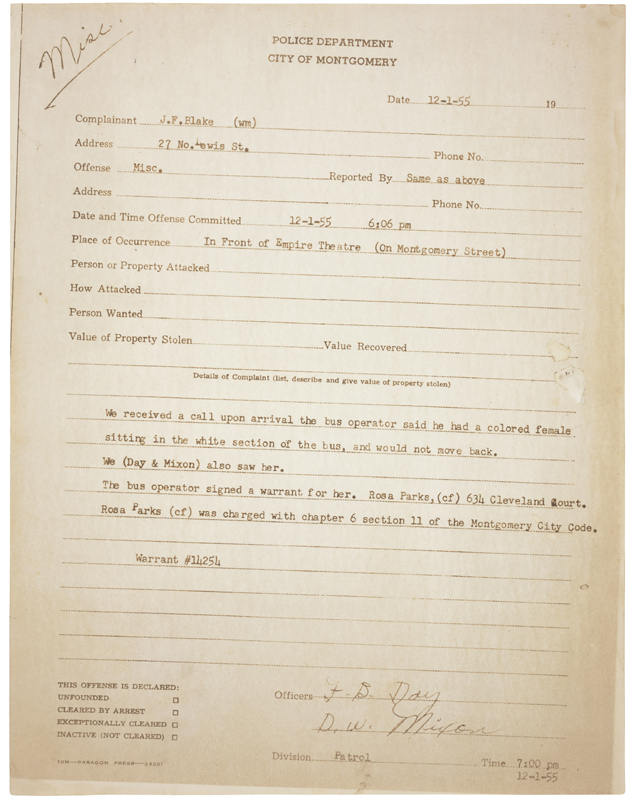 The arrest report (above) states that Parks was sitting in the white section of the bus. Actually, she had complied with the law when she first entered, sitting down behind the first 10 seats which were permanently reserved for whites. (See the chart below; the front of the bus is at the top of the chart, with the driver's seat designated by an "X.") 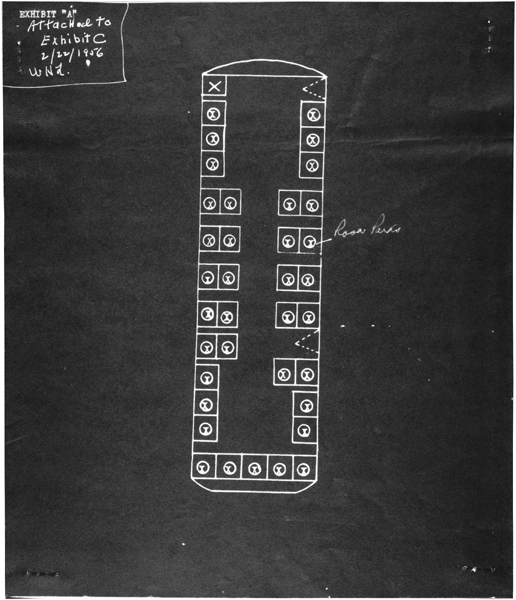 Under Montgomery law, the bus driver had the discretion to move blacks farther back when the white section filled up. Black people paid the same fare as whites, but were often ordered to exit the bus after paying the fare and re-enter through the back door. In standing-room-only conditions, they were not allowed even to stand next to white people. Blake wanted the seats. "I had police powers -- any driver did." The bus was crowded and the tension heightened as Blake walked back to her. Refusing to assume a deferential position, Parks looked him straight in the eye. Blake asked, "Are you going to stand up?" Parks replied, "No." She then told him she was not going to move "because I got on first and paid the same fare, and I didn't think it was right for me to stand so someone else who got on later could sit down." "Well, I'm going to have you arrested." "You may do that," Parks replied. Regardless of her background, or her ‘tiredness’, it was still a courageous thing to do. The world’s a better place for her actions, intended or otherwise. Had Rosa Park made the choice to stay seated in todays world, being black, she most likely would have been shot for resisting arrest. 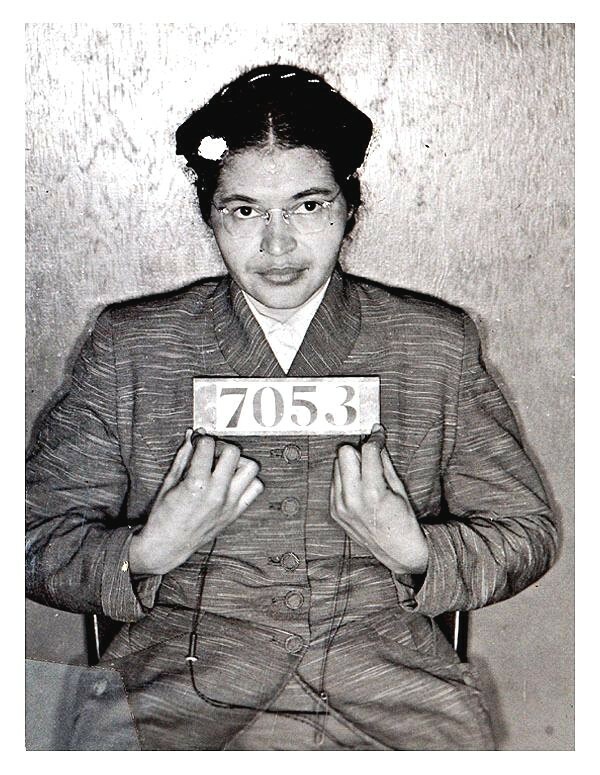 The mugshot is from 1956 when she (Rosa Parks) presented her self for arrest when carpools used to boycott Montgomery’s buses where banned. I was only three years old at the time, but I’m glad she stayed seated.